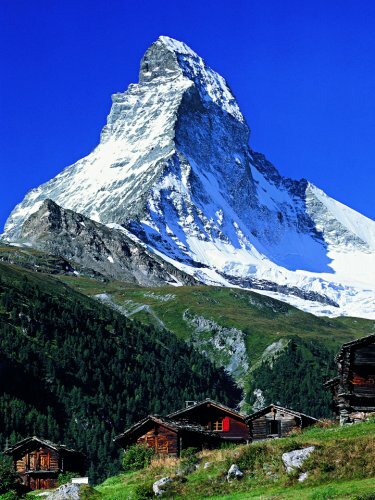 The "Matterhorn" is one of the world's most famous mountain. It rises 4478 meters high, but is not the highest mountain in Switzerland (see mountains for more details). The first men who managed to climb to the top of this mountain was a group of seven mountaineers led by Edward Whymper from Great Britain on July 14, 1865. Four of the seven men died on the way back. It is unknown who named this mountain "Matterhorn" or where the name comes from, but there are many families in this valley named "Matter". 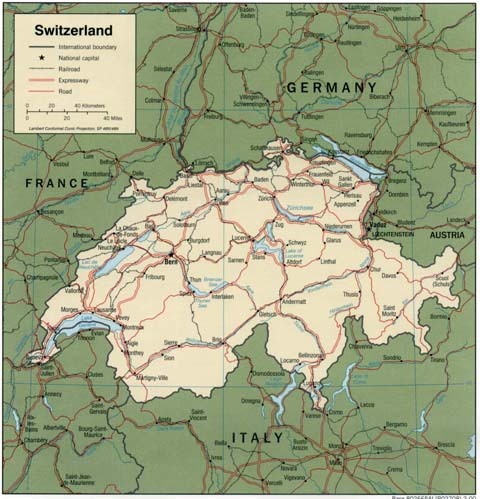 From a climate point of view, Switzerland is located in a transition zone. In the west, there is a strong influence of the Atlantic ocean. Winds bring a lot of moisture into Switzerland and cause rainfall. In the east, there is an almost continental climate, with lower temperatures and less precipitation. On the other hand, the alps - which run from east to west - act as a climatic divide. South of the alps, there is an almost Mediterranean climate, with significantly higher temperatures but also a lot of precipitation. Generally speaking, spring is wet and cool, April is well known for fast and often changing weather conditions. Summer is supposed to be warm and dry with maximum temperature up to 35°C (95°F). The temperature depends primarily on the elevation, the zero line (0°C or 32°F) may raise as high as 4000 meters above sea level (13125 feet). Fall is usually dry, but cool. The temperature will drop significantly in September or October, with the zero line around 2000 meter above sea level (6560 feet). Winter is supposed to be cold and dry. The temperature may drop below 0°C everywhere in Switzerland, especially at night. In the alps, they usually get a lot of snow, but even at lower elevations, there is a good chance that they will get a foot of snow every now and then. See Climate in Switzerland for much more detailed information and links to weather forecast services. 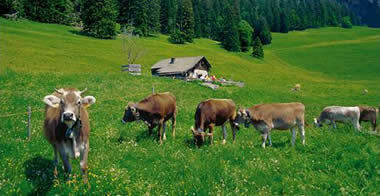 Switzerland is the pioneer of bio-agriculture and of keeping livestock in appropriate conditions. Over thirty years ago the foundations for the development of bio agriculture were laid. Its objectives were the sustainable use of natural resources, the protection of the environment and of animals and the production of healthy food. Today Switzerland has the highest per capita consumption of bio products in the world; 11.2% of all farms and 10.5% of all agricultural land are devoted to bio agriculture. Bio agriculture is strongest in the alpine regions. In the Canton Graubünden 51.8% of agricultural land is used for bio products. Switzerland stands on the route linking northern and southern Europe, but the Alps made transit difficult until tunnels were built through them. The Gotthard railway tunnel, 15 km (9.3 miles) long, was built more than 100 years ago. The Gotthard road tunnel, opened in 1980, was the longest in the world at 16.5 km (10 miles) until Norway's Laerdal tunnel (24.5 km/15 miles) opened in November 2000.